1. In large microwave-safe bowl, stir cauliflower pearls and water; cover with plastic wrap and heat in microwave oven on high 12 minutes or until very tender; let stand 30 minutes. Transfer cauliflower to clean kitchen towel; squeeze until very dry. 2.Preheat oven to 450°. Line cookie sheet with parchment paper. 3.In same bowl, stir cauliflower, egg whites, mozzarella cheese, Parmesan cheese, 1-1/2 teaspoons oil, salt and pepper. Press cauliflower mixture into 14-inch circle on prepared cookie sheet. Bake 24 minutes or until browned. 4.In small bowl, stir garlic and remaining 1-1/2 teaspoons oil. Brush crust with oil-garlic mixture; top with tomatoes and feta cheese. Bake 7 minutes longer or until top is lightly browned. 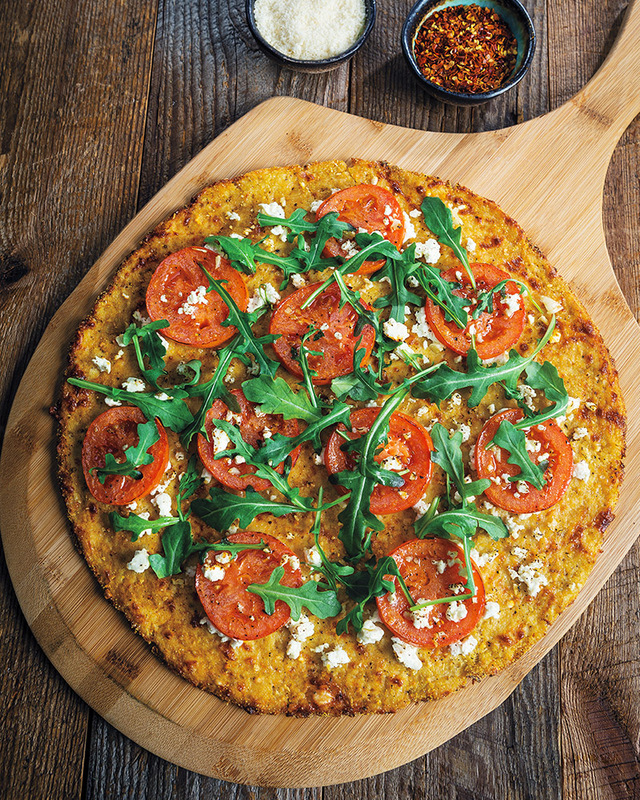 5.To serve, sprinkle pizza with arugula; cut into 8 wedges. If cauliflower pearls are unavailable: Coarsely chop 1 medium head of cauliflower. In 2 batches, pulse the cauliflower in a food processor 10 times or to a rice-like consistency. > You can find pre-riced cauliflower in our produce department or within our frozen foods. Within frozen foods, you will also find blends of riced vegetables that might be fun to try out, such as riced cauliflower and sweet potato. The sweet potato would add an extra bit of sweetness to your crust!.